They're wiggly, not particularly accommodating and most certainly don't smile on command. They don't sit, stand or pose. Yet, as a photo subject they are without question among the most captivating. 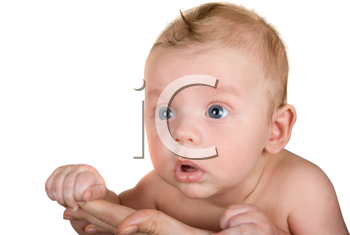 Taking pictures of newborn tots is unlike any other type of portraiture. The sitting is dictated by moods, meals and messes. There are cranky faces and dirty diapers to contend with if things aren't timed just exactly right. Yet, we are all so charmed by their beguiling innocence, awed by a presence that reminds us of the miracle of birth, we are desperate to preserve this time for posterity. With the limitations placed on what exactly the newborn can do as far as poses; safe to say they will be lying down; baby photographers stretch their creativity to come up with unique ideas. Anne Geddes is, if not the first to think outside the box by taking advantage of the newborn's pliability to pose them in flower and fruit costumes, perhaps the most known and controversial. Quite often, though, just zooming in on one of those precious faces is enough. Soft pursed lips and wide eyes, contented sleep, a dimple and tiny grin are perfection. Desperate to get some good pictures of my grandson after disappointingly lacklustre professional results, I tried every angle and every idea, soon developing a new respect for newborn photographers. Then I took note of that sweet smile and long lashes realizing that this little charmer was showing me all I needed, so I moved in nice and close.